I always tend to cut a lot of high frequency on hi hats, shaker, tambourine. I have been using tape and musical eq like the Trident A, but adding the Bx refinement to the arsenal is a bonus to cut less high frequency with a surgical EQ. Great stuff especially for 54$ on special with a 25$ voucher ! This is a great tool for stereo enhancing. But it also works to get things to sit better in the mix tonewise by reducing harshnes. Haven't gotten to really run the full paces on this thing yet on full mixes but can attest it definitely (when used tastefully!) can enhance a full mix by dynamically sucking out nasty upper-mid frequencies that "knock" on your ear drum. Too much and you can make your mix sound like a pillow. The right amount can class up a mix though. But... on a drum submix... wow! I have been using it on my drum buss in a 'top down' method where I put it as the first insert on the chain and run it together with as much other processing as I think i will need on the drum buss (compression, tape emu, eq, etc...) and start shaping the drum mix with that in broad strokes. Then, tweak individual channels. Really cleans up the overheads and snare especially!! There really isn't a comparable plugin. The description may make it seem like it acts like a deesser focused on the harsh upper mids, but there is more to it. This fall into the category of secret weapon plugins. I use it more for mixing than the intended mastering purposes. It's wonderful on distorted guitars and has replaced the deesser at 4kHz technique for me in that application. I get much more natural and pleasing results with this. You just have to try the demo and you'll see it's a must have tool. The controls are quite simple and the effect very subtle, so it is very hard to screw up and regret your settings months later. Tape compression and tubes (bells and whistles) are really not even necessary for a nice phat warm drum bus. I originally bought this to solve a particular problem in a mix - which it did very nicely. However, I have since used this on all kind of sources in my mixes and find it to be a very useful tool for taking the edge off things. I find it to be a great tool to have around. I use this guy on all my Masters ! It is a little friends, remove the annoying hardness of the tracks. Initially may seem insignificant but if you make bypass, at the end of process of mastering, you will find the great job ! Only 4 star instead of 5 because all Brainworx plugins, when there are discount, offer little discount compared of other brand. I stand by my earlier review - this plug-in is a must have for In The Box mastering work, and even tracks would benefit, potentially making the mastering engineer's life easier. I still would request an adjustable frequency range (from 1 kHz - 6 kHz) instead of the fixed center around 2 - 3 kHz. My big gripe is that, for the first time, brainworx came out with a native version within 2 weeks of the UAD release. Before, either brainworx plug-ins were around a long time before porting to UAD, or they only made a UAD version (Millennia NSEQ-2 comes to mind), with few exceptions. Why the gripe? I would have picked up the native; it is not that DSP intensive. UA and brainworx should have a cross-grade discount! Tried the demo on a couple of tracks and until you A/B the tracks with this plugin you don't realize how harsh and digital they sounded before ? Strange really as the Studer tape emulations and Manley EQ's i thought were taking the harsh digital sound away?, But having this plugin in the mastering chain does make the difference and have made my tracks more Analog sounding !!? Does what it says and i will consider it for a future purchase. I've tried it on 2 projects, the accumulation of tracks (virtual strings) always created an unpleasant sensation around 3-4 kz, but this problem disappears like magic with this plugin. My next purchase for sure. Demo'd it over a few tracks. It does exactly what it claims to do, and does it extremely well and easily. The oscillator is a nice touch for adding a bit of life and a subtle breathing quality to the track. Probably worth the 200, though I still kinda wanna save my money to see what UA comes out with in another couple months. Outstanding? Yes! Can I get a discount? No! I have to hand it to UAD' Marketing Department. They certainly know how to use their promotions at 'Cracker-Jack' timing. I get the latest V 7.6 update email, upgrade my software, hit the 14-Day Trial button, instantly fall in love with bx_refinement Plug-In, go back to the store, put it in my basket, add my APR2014 coupon and what do I get? "Coupon cannot be used to buy anything new in V 7.6". Guys, I love your plug-ins. I have over 40 of them, but come on! Some of us have to work day-jobs to support our UAD plug-in addictions. Cut us some slack! Please! Something like super invisible de-esser for whole mix. 2) working frequence is fixed 3.3 Khz now. It will be good option to change it from 1 to 8 kHz. So it will be really flexible tool to tame those "russian 4 kHz" or "jewish 6 kHz". 5) there should be SNAP function in Oscillator section when sync mode engaged. You can have the best gear in the world but if the song isn't good it doesn't matter. UAD plug-ins polish turds very well. 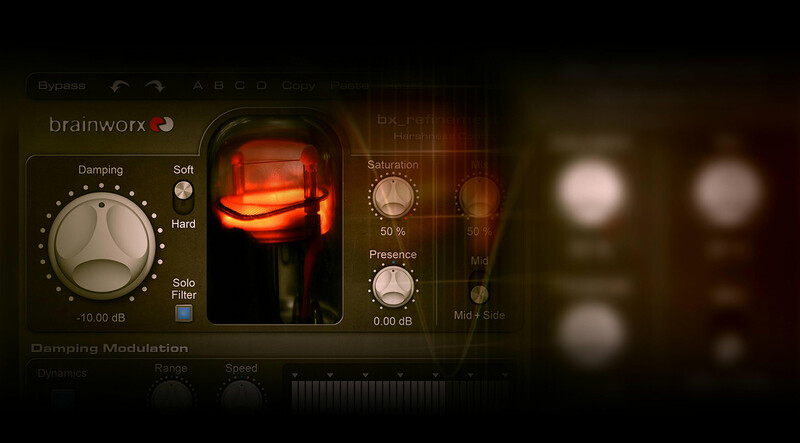 I use the refinement plug-in in my mastering chain. It glues the track together and warms it up to my contentment thus putting a polish on my wonderful turds. I like to throw it on rough mixes to clients so they can get a better perspective on what their product will sound like when finished. This is a much needed purchase for me and is one that I demo'd every time from previous purchases. My turds are on the top 5 local charts on Reverb nation and I have submitted to the 2015 Grammy awards. I'm very proud of this turd. Todays Price is 79,- Euros. That's not fine, dear Universal Audio Guys. Sorry, I feel very frustrated, cause 100 Euros are much money for me & my homestudio. Through your pricingpolicy the plug-in takes more than 50 percent less value within 6 days. Before I continue purchases, I'll think about whether I buy in the future at UAD. Demoed UAD version and Brainworx Native version at same time. UAD version certainly has more depth and weight to it's sound. Native version is thinner. Use the bx_refinement in my mastering chain erverytime and i can reduce harshness while improving the transients. It´s amazing. I think, i can´t live without it anymore.